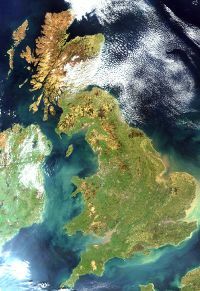 True color image of Great Britain, captured by a NASA satellite on 6 April 2002. Great Britain is the largest island of the British Isles. It lies to the northwest of Continental Europe, with Ireland to the west, and makes up the larger part of the territory of the United Kingdom. It is the largest island in Europe and eighth largest in the world. It is surrounded by over one thousand smaller islands and islets within the Atlantic Ocean, North Sea, Irish Sea, Celtic Sea, and the English Channel. As a part of the once powerful British Empire, Great Britain played a central role in history; one of the world's most influential centers of cultural development. Though the imperial system had its ills, it left a cultural, literary, legal and political legacy that has been adopted throughout much of the world. Great Britain is an island off the north-west coast of continental Europe. It is the largest island in Europe, and consists of England, Scotland, and Wales. The terms "Great Britain" and "United Kingdom" are often used interchangeably, however the U.K. includes Northern Ireland, a number of offshore islands and several overseas territories in addition to Great Britain. Difficulty in understanding which words to use in describing various geographical and political entities within the area of the British Isles is common. Innocent misuse in this often politically sensitive area can cause unwitting offense to natives of the area. 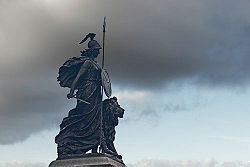 The Roman leader Julius Caesar conquered Gaul and was responsible for the first Roman invasion of Britannia in 55 B.C.E. At the time of his invasion, the native population of the island later known as Great Britain were called Pretani by the Celts of Gaul. Greek writers soon termed the island, along with present-day Ireland, the "Pretanic Islands." Caesar substituted Brittani or Britanni for Pretani. The island had formerly been known as insula Albionum, the "island of the Albions" (or Albio or Albion). From Brittani the by-form Brittones also came into use. The term "Bretayne the grete" was used by chroniclers as early as 1338, but it was not used officially until James I of England succeeded Elizabeth in 1603. He proposed that the union of the crowns should be followed by a governmental union and suggested the name Great Britain. Though the English parliament did not agree, King James adopted the name by proclamation and used it on his coinage. It was given statutory authority by the Act of Union with Scotland in 1707. In 1801 Ireland joined the union, which then became known as the United Kingdom of Great Britain and Northern Ireland. Technically, Great Britain is the island unit of consisting England, Scotland and Wales. Though the sovereign state of the United Kingdom includes Great Britain as well as Northern Ireland, the simple term "Britain" is often used synonymously to that nation. 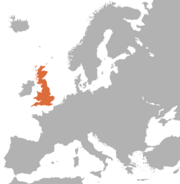 Great Britain is located off the northwest coast of continental Europe. Comprised of England, Scotland, and Wales, it has a total area of 88,386 square miles (228,919 square kilometers), making it the largest of the British Isles. Broken down further, England is 50,301 square miles, Scotland is 30,080 square miles, and Wales at 8,005 square miles. The island stretches over approximately ten degrees of latitude on its longer north-south axis. Geographically, the island is marked by low, rolling countryside in the east and south, while hills and mountains predominate in the western and northern regions. Before the end of the last ice age, Great Britain was a peninsula of Europe; the rising sea levels caused by glacial melting at the end of the ice age caused the formation of the English Channel, the body of water which now separates Great Britain from continental Europe at a minimum distance of 21 miles (34 kilometers). The major cities in England are London, Liverpool, Manchester, and Birmingham. The chief cities of Scotland are Edinburgh, Glasgow, Aberdeen, and Dundee. The chief urban centers of Wales are Cardiff, Swansea, and Newport in the south, and Wrexham in the north. Great Britain is no longer a country, but simply an island in the United Kingdom. Politically, "Great Britain" describes the combination of England, Scotland and Wales, and therefore includes a number of outlying islands such as the Isle of Wight, Anglesey, the Isles of Scilly, the Hebrides, and the island groups of Orkney and Shetland, but does not include the Isle of Man or the Channel Islands. Great Britain has evolved politically from the gradual union of the kingdoms of England and Scotland which began in 1603 with the Union of Crowns under James VI of Scotland (James I of England) and eventually resulted in the Acts of Union in 1707 which merged the parliaments of each nation and thus resulted in the formation of the Kingdom of Great Britain, which covered the entire island, to the situation following 1801 in which Great Britain together with the island of Ireland constituted the larger United Kingdom of Great Britain and Ireland (UK). The UK became the United Kingdom of Great Britain and Northern Ireland in 1922 following the independence of five-sixths of Ireland as first the Irish Free State, a Dominion of the then British Commonwealth, and then later as an independent republic outside the British Commonwealth as the Republic of Ireland. The island of Great Britain was formed around nine thousand years ago at the end of the Pleistocene ice age. Prior to that time the island was connected to the European mainland in what is now northeastern France. When sea levels rose due to isostatic depression of the crust and the melting of glaciers, the area was cut off from the continent, forming an island. In Cheddar Gorge near Bristol, the remains of animals native to mainland Europe such as antelopes, brown bears, and wild horses have been found alongside a human skeleton, "Cheddar Man," dated to about 7150 B.C.E. Great Britain was first inhabited by people who crossed over the land bridge from the European mainland. Its Iron age inhabitants are known as the Brythons, a group speaking a Celtic language. Most of the island, except the northernmost part, was conquered to become the Ancient Roman province of Britannia. After the fall of the Roman Empire, the Brythons of the south and east of the island became assimilated by colonizing Germanic tribes (Angles, Saxons and Jutes) and became known as the English people. Beyond Hadrian's wall, the major ethnic groups were the Scots, who may have emigrated from Ireland, and the Picts as well as other Brythonic peoples in the southwest. The southeast of Scotland was colonized by the Angles and formed, until 1018, a part of the Kingdom of Northumbria. To speakers of Germanic languages, the Brythons were called Welsh, a term that came eventually to be applied exclusively to the inhabitants of what is now Wales, but which survives also in surnames such as Wallace. In subsequent centuries Vikings settled in several parts of the island, and The Norman Conquest introduced a French ruling elite who also became assimilated. Since the union of 1707, the entire island has been a related political unit, first as the Kingdom of Great Britain, later as part of the United Kingdom of Great Britain and Ireland and then as part of the present United Kingdom of Great Britain and Northern Ireland. Since the formation of this unified state, the adjective British has come to refer to things associated with the United Kingdom generally, such as citizenship, and not the island of Great Britain. The term "Great Britain" was used officially for the first time during the reign of James I of England. Though England and Scotland each remained legally in existence as separate countries with their own parliaments, on October 20, 1604, King James proclaimed himself as "King of Great Brittaine, France and Ireland," a title that continued to be used by many of his successors. In 1707 an Act of Union joined both parliaments. That Act used two different terms to describe the new all island nation, a "United Kingdom" and the "Kingdom of Great Britain." However, the former term is regarded by many as having been a description of the union rather than its name at that stage. Most reference books therefore describe the all-island kingdom that existed between 1707 and 1800 as the Kingdom of Great Britain." In 1801, under a new Act of Union, this kingdom merged with the Kingdom of Ireland, over which the monarch of Great Britain had ruled. The new kingdom was from then onwards unambiguously called the United Kingdom of Great Britain and Ireland. In 1922, twenty-six of Ireland's 32 counties attained independence to form a separate Irish Free State. The remaining truncated kingdom has therefore since then been known as the United Kingdom of Great Britain and Northern Ireland. ↑ Figure refers to the population of the United Kingdom excluding Northern Ireland, and includes about 500,000 persons on smaller islands. ↑ Christopher A. Snyder, The Britons (Malden, MA: Blackwell Pub., 2003, ISBN 0631222626). ↑ "Great Britain," A Dictionary of British History (Oxford University Press, 2001, 2004). ↑ Guardian Unlimited, Style Guide. Retrieved February 9, 2017. ↑ Great Britain Travel Information, Antor.org. Retrieved February 9, 2017. ↑ Robert Lacey, Great Tales from English History (New York: Little, Brown and Company, 2004, ISBN 031610910X). ↑ François R. Velde, "Royal Arms, Styles, and Titles of Great Britain: Documents," British Heraldry. Retrieved February 9, 2017. Churchill, Winston. A history of the English-speaking peoples. New York: Dodd, Mead, 1956. This page was last modified on 11 July 2017, at 19:40.